Equipped with one 5 Gb/s USB 3.0 port, one 3 Gb/s eSATA port, and two 800 Mb/s FireWire 800 ports, the G-SPEED Q features an internal RAID controller that will support RAID 0 for performance and RAID 5 for data redundancy. The array will also support data transfer rates of up to 252 MB/s. The G-SPEED Q comes pre-formatted as HFS+ for Mac OS 10.6 and later and is also compatible with 64-bit versions of Windows 8, 7, Vista, and XP via a reformat. Please bear in mind that 32-bit operating systems which limit maximum volume sizes to 2.2TB are not supported. Included with this array are a universal AC power supply, four removable disk modules, a USB 3.0/2.0 cable, a FireWire 800 cable, and an eSATA cable. It is protected by a limited 3-year warranty. Hire the G Speed Q 24TB Raid 5 Hard Drive from Procam. 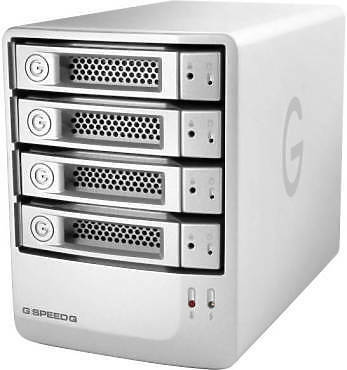 Best service and rental rates for the G Speed Q 24TB Raid 5 Hard Drive and all cameras, lenses, sound, lighting and grip.